Oscar García Rivera was the first Puerto Rican to be elected to public office in the continental United States. In 1937, when he won a seat in the New York State Assembly representing the 17th District, its 20,000-strong Puerto Rican East Harlem community celebrated for days. When Mr. García Rivera was re-elected the following year in a coalition that included Vito Marcantonio, an activist representing East Harlem’s Italian immigrants in Congress, victory was even sweeter. During the depths of the Depression, García Rivera ran for public office as a Republican, with the support of independent Democrats, labor unions, and liberal Republicans against the corrupt and racially biased Democratic political machine of Tammany Hall. Indeed, New York City had a tradition of “progressive” Republicanism opposed to Tammany Hall. For example, Fiorello LaGuardia, the legendary mayor and reform Republican, also ran as the nominee of the American Labor Party, a militant union-oriented group that supported FDR for president from 1936 onward. 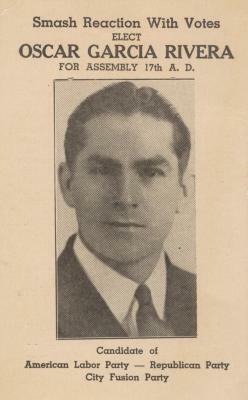 Oscar García Rivera was re-elected to successive terms in 1938 and 1939, serving a total of three years in the Assembly as part of the “City Fusion Party” under the auspices of reformist groups, including the American Labor Party. Born in 1900 in Mayagüez just two years after Puerto Rico was acquired by the U.S. as a result of the Spanish-American War, Oscar García Rivera was the son of wealthy coffee plantation owners. At an early age, he demonstrated exceptional scholarship and leadership qualities. As an adult, García Rivera saw himself as a defender of the poor and an advocate for New York’s Puerto Rican community. Among the first graduates of St. John's University School of Law, García Rivera emphasized issues of child labor, protective laws for workers, and anti-discrimination legislation. He helped organize the Postal Clerks' Union of America, encouraging Hispanic employees to push for higher wages and better working conditions. As an assemblyman, in 1939, the Assembly passed his Unemployment Insurance Bill. Subsequent bills sought to establish minimum hours and wages. In 1940, he served as a delegate to the National Republican Convention in Philadelphia and as executive secretary of the New York Puerto Rican Republican Association. In 1956, he achieved another first by becoming the first Puerto Rican to be nominated as the Republican candidate for Justice of the City Court. How do political leaders influence society? Identify the purpose of the poster and evaluate the significance of this document in encouraging civic participation by new immigrants. Campaign flyer for Oscar García Rivera, candidate for the New York State Assembly, 1938. What does “Reaction” mean in the flyer’s statement “Smash Reaction With Votes,” in terms of the political thinking of the 1930s? In a five-paragraph essay, evaluate the impact of the Spanish-American War (1898) and the Great Depression (1929–1940) on Puerto Rican migration patterns to New York City. Find out more about the American Labor Party, the Republican Party, and the “City Fusion Party.” Do they exist today? What are their goals? Would Oscar García Rivera agree with their ideas today? Music: Make up a campaign song for Mr. García Rivera. Art: Create a political cartoon of the results of the election.